This sauce is delightful in every way. It tastes like summer in a jar, pairs wonderfully with just about anything you can dream up, and is so simple to make it almost makes itself. I'm not kidding. 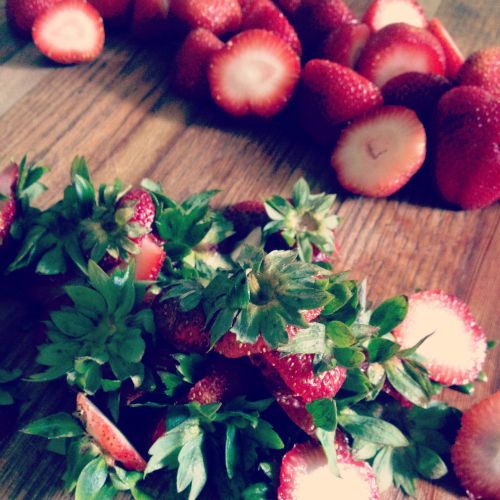 Slice/dice/chunk up the strawberries, whichever texture you prefer. 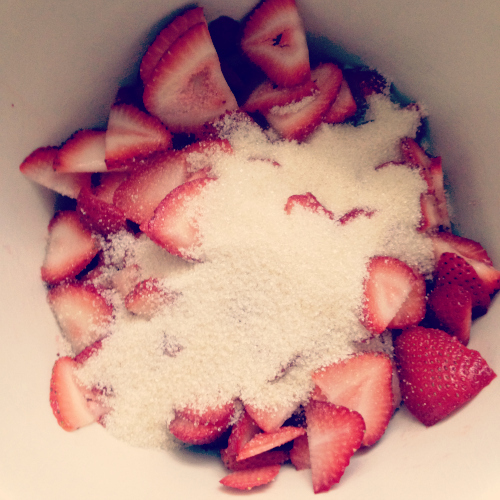 Pour half a cup of sugar over top and toss to coat. Walk away for 10 minutes to unload the dishwasher or scroll thru instagram, you know, whatever you do to kill 10 minutes. And come back to a wonderfully delightful sauce! It could not be any more simple. If you really want to complicate it, slice open a vanilla bean and add the caviar. Yum! You can also add a splash of lemon juice if you like, or even puree the entire mixture if you want to go that far. I adore it in the simplest form, but feel free to go crazy! If you want a thicker version just mix in a bit of corn starch. We absolutely love it with greek yogurt. It isn't too sweet the way straight honey can be or not sweet enough the way fruit alone can be. It's the perfect marriage. I also spooned it over gluten free pancakes for a decadent breakfast in bed this weekend. It's like strawberry shortcake, for breakfast, but you don't feel guilty in the least. And let's not even talk about how perfect it is poured over vanilla ice cream. Perfect, I tell you. Slather it on toast or biscuits, pour it over pound cake or cheesecake or even rice pudding. The variations are endless. Simply store in a mason jar in the fridge and enjoy!